If you read Part 3 of Eating Like a King On A Shoestring Budget I strongly advise grocery shopping from your freezer first (but only if you like eating like a king and saving swacks of money!) The reason for this, I explain, is it then frees up money-space for the sale items that aren’t on your Eat Sheet™! This way you never pay full price for meat EVER! You must read that blog if you haven’t! (but skip it if wasting money and throwing away freezer burned meat from 1967 is fun for you!) Ok Ok, I’ll drop the freezer thing! Back to the pantry! First I’d like to tell you why I’m not a fan of overstocking the pantry and therefore don’t usually recommend it! I believe we get a little faked out by buying a case of something that simply looks organized and pretty… but you may never get to it! Sales are on a rotation! There is really no need to do that unless you’re saving up for doomsday! (In which case someone might try and kill you for your food! Lol.) Look, I’m only poking fun! I know there’s a lot of people who really enjoy doing this, with coupons and such, and if it really brings you joy and you really are properly organizing, using and rotating your stock….all the power to you! But the average person doesn’t work that way! The more common approach is, “Wow, great deal. I’ll buy 6…then it gets buried in a heap of other deals that you feel guilty about throwing out in the far future—yet scared to eat because it expired last year! There really is a happy middle for the “great deal enthusiast” such as myself! For those like me here’s what I recommend. Don’t follow some crazy generic list of what you should have in your pantry! My pantry list will not be your pantry list! What I do find useful though (and have now added to all of our books) are ingredient uses! For every item in our books, we explain what else you can use it for! So if you have a jar of something and only use it for one thing…you never know…it could be used for all sorts of things! 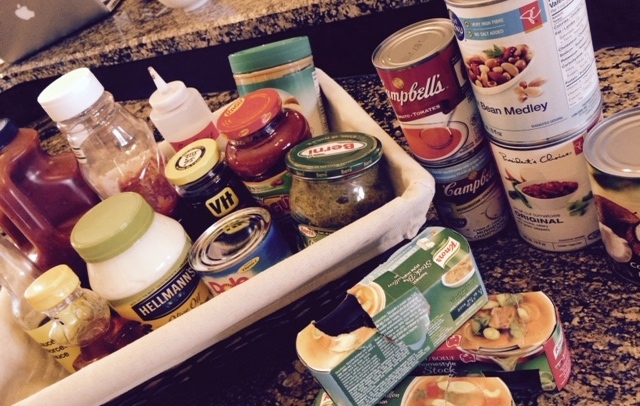 If you’re starting out and have no idea what and why you buy pantry staples…. As a meal planner working with families for almost 20 years, I can wholeheartedly tell you, unless filling your pantry with uber sales is a conscious hobby…it will cost you more money than it will save you! It’s a mistake to use up the money-space on your grocery budget with a whole lot of one thing unless that is the thing you use A LOT! I spend approx. $40-$80 per week. I rarely go over $60. I feed 4 healthy adults dinner and lunch all week. (This also includes breakfast and snacks!) This cost will likely seem very low to the average person. For some it may seem high—remember I eat like a king! We splurge on King crab from time to time; I love my monthly rack of lamb…nothing is spared! Now write down the common ingredients you tend to buy all the time. Add condiments and things you use on sandwiches, toast, etc to your list! Of course you will also have essentials like flour, baking soda, sugar, nuts, etc. Boom! You have your pantry list! Pour a tea or coffee one day and take a real good look at the recipes you make regularly. -If you have broths and soups, you are ready for almost any base of a sauce or soup. -Coconut milk is awesome for almost any Indian and Asian dish in a flash if you have veggies and curry. -Stewed tomatoes have too many uses to mention. They can stand alone or go in anything for a quick throw together meal. -Pineapple tidbits rescue my clean up veggies and meat when I mix with broth, soy sauce and a little brown sugar or honey for simple and easy sweet and sour. -Tuna…heeeelo, instant protein for quick mac & cheese or anything else for that matter. -Mixed bean medley - same reason vegetarian style. I always toss these into my brothy soups. -Soy sauce adds a gorgeous salty flavor and also creates a wonderful depth of colour. Worcestershire does the same but adds more tang! -Jams are great on toast and sandwiches and ammmaaazing in sauces for a little extra depth of flavor and thickening power. -I love spare rib sauce to add to Asian style dishes as well as use it stand alone…a little splash for a stir-fry goes a long way! -Spaghetti sauce, instant dinner and fabulous pizza base. –Ketchup is a tomato base for so many dishes. -Salsa are just amazing chopped up tomatoes all spiced for you if you are just too pooped to chop! -Dijon mustard is great for sandwiches and hot dogs, I always add a little to my egg salad sandwich spread and always add it to a cream sauce…well Ok the list goes on for that one! -Hot pepper relish means I don’t have to cut up jalapenos if I’m lazy, and adds a fantastic burst of heat to almost any sauce. -Peanut butter means I don’t have to crush nuts for Indian and Asian dishes! (I’m also known to dig myself up a big spoonful when I’m swamped and hungry-sad but true)! -Cornflake crumbs mean instant chicken fingers (Italian bread crumbs work well too) -Bisquick—instant biscuits, instant dumplings as well as adding it to my egg mixture when I make quiche so it creates it’s own little crust aaand bonus…less calories and yummy! -Quinoa, rice and pasta of course are essential must-haves for almost-instant dinners! But here’s the thing…If hot pepper relish is on sale for some amazing price, will I buy a case? Noooo… I use it quite a bit so maybe I’ll buy 2 max! It will be on sale again by the time I use those up or get close! Remember a pantry stock up is all about you and how your family functions! No one can tell you what you need; only you can determine that! I’d love to see some lists of what you buy and why! I am always learning something new and it’s so awesome to share great information with other parents…who are just trying to stick to their shoestring budget! (While eating like a king! Over the next few days I’ll toss you the recipes in my plan and we’ll finish up the week with Part 5 (the final of this series) of Eating Like a King On A Shoestring Budget! Great list! We love PC’s Memories of … sauces. Particularly the Memories of Portugal Piri Piri which is our favourite Stir Fry sauce. Rice, veggies, pork or chicken and an awesome sauce! Just had it for supper. Yum! White vinegar is another must for my pantry. For seasoning, cleaning, making “buttermilk” in a pinch, got to have it! We’re officially hooked on Mrs. Dash thanks to your recipes. Like it’s cause for panic if we’re out.